On this date in 1541, an English peer hanged (!) at Tyburn for an unpremeditated murder. Thomas Fiennes, scion of an ancient title still* extant today, was more accustomed to doling out the death sentences. Dacre sat on the jury of peers that condemned Anne Boleyn, and also helped doom plotters in the Pilgrimage of Grace and the Exeter Conspiracy. This well-favored but evidently unrefined young rowdy had a penchant for the illicit hobby of poaching game, just becoming in this period a conflict zone in the proto-capitalist enclosure movement. We may suppose that a callow youth of privilege didn’t have the means of production on his mind, just an overweening sense of entitlement about the forests of the next lord over. In any event, a 1537 letter to Thomas Cromwell testifies to the young Fiennes’ vice. We don’t have the particulars of this situation, but secret detestation notwithstanding, four years’ time finds Fiennes up to similar shenanigans. In this later, fatal case, our sportsman and a group of retainers went out to hunt deer on the lands of his neighbor, Sir Nicholas Pelham. There, they encountered some men of Pelham’s, and in the ensuing melee, one of the latter party was beaten to death. Pelham pressed the issue aggressively. 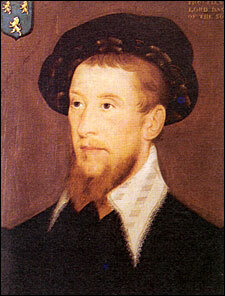 “Overpersuaded by the courtiers, who gaped after his estate,” Fiennes tried the dangerous gambit of pleading guilty and casting himself on the king’s mercy. The fact that testimony indicated that Fiennes himself had not participated in the fight might have meant an acquittal, though a guilty plea also positioned Fiennes to exculpate his mates. Gaping courtiers may have realized better than their prey that the king’s mood this summer tended towards severity. Spurning a recommendation of clemency from the peers of the realm, Henry VIII insisted on Dacre’s execution. The affairs of the luckless baron’s last day — which was only four days after his trial — remain a bit mysterious. Hopes for a clemency were raised by a last-minute reprieve from a scheduled morning beheading, only to have the noble led out that afternoon to the beneath-his-class death by hanging at Tyburn. Oh, and the mates Dacre was (possibly) trying to protect? Three of them hanged this date as well, at St. Thomas a Watering on the Old Kent Road. * It hasn’t been continuously extant, strictly speaking — in fact, it was terminated along with Thomas Fiennes, only restored in 1558 to the hanged man’s son. These Tudor toffs are distant relations of actor Ralph Fiennes, whose turn as a hanged Nazi war criminal has already been noted in these pages.